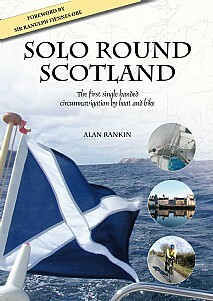 In April 2006 the author became the first person to single-handedly circumnavigate Scotland by boat and bike. Setting out on this ultimate adventure from Kirkcudbright on the Solway Firth, Alan sailed around Scotland on a 50-foot yacht to the north-east coast of England. After 16 exhausting days on the yacht, he then cycled 163 miles back to the starting point in Kirkcudbright. The 1000-mile voyage took Alan in the yacht Pegasus to the wild open Atlantic Ocean passing Islay, Barra Head, St Kilda, North Rona and round Muckle Flugga, the most northerly point of the UK, before landing at Blyth, Northumberland. The cycle trip crossed England and brought Alan back into Scotland at Gretna and from there he followed the Solway coastal route back to the church gates in Kirkcudbright. This herculean challenge required detailed planning and attracted over 20 people into the support team including an Olympic weather router, an Olympic sail-maker, a round-the-world skipper, a renowned sleep management specialist and a multiple champion in Scottish sailing. The motivation behind the trip came from Alan's deep-rooted desire to take on a challenge that would test his skills, resolve, stamina and sheer willpower to get the job done. It also provided him with an opportunity to raise money for two charities - the Parkinson's Disease Society and Ocean Youth Trust Scotland which will both benefit from sales of this book. This gripping story will be of huge interest to all outdoor enthusiasts, sailors and adventurers and anyone who appreciates a good read. An inspirational read that is set to become an adventure classic.